Lakeside Animal Hospital 615 Main St. Ext., Moncks Corner, SC (843)761-4920. April is Vaccine Clinic Month! 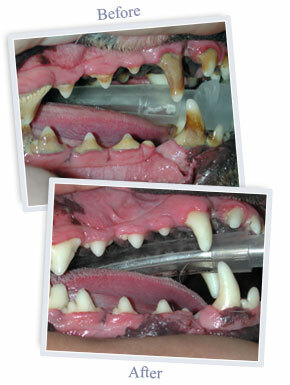 Regular dental care for your pet is about more than simply fresh breath and white teeth. It is an important piece of a preventive care regimen because numerous diseases can either originate or be exacerbated by poor dental hygiene and care. For this reason, Lakeside Animal Hospital recommends that your pet's teeth get cleaned on a regular basis. Dental problems are easily prevented, but if they are left untreated, they can often lead to larger systemic problems due to oral bacteria entering the bloodstream and damaging internal organs including the kidneys, heart and liver. Pets have dental disease just like you do. Many of these problems can be avoided by bringing your pet in for regular checkups and teeth cleanings. Dental care does not end with a visit to your veterinarian. You need to continue your veterinarian's good work at home. 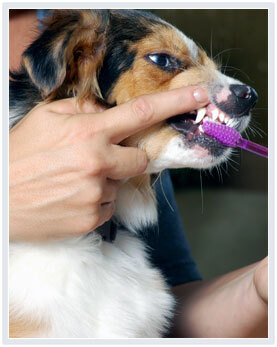 Brushing your pet's teeth is an important part of home dental care. Any member of the Lakeside Veterinary Hospital team can show you the proper method for brushing your pet's teeth.